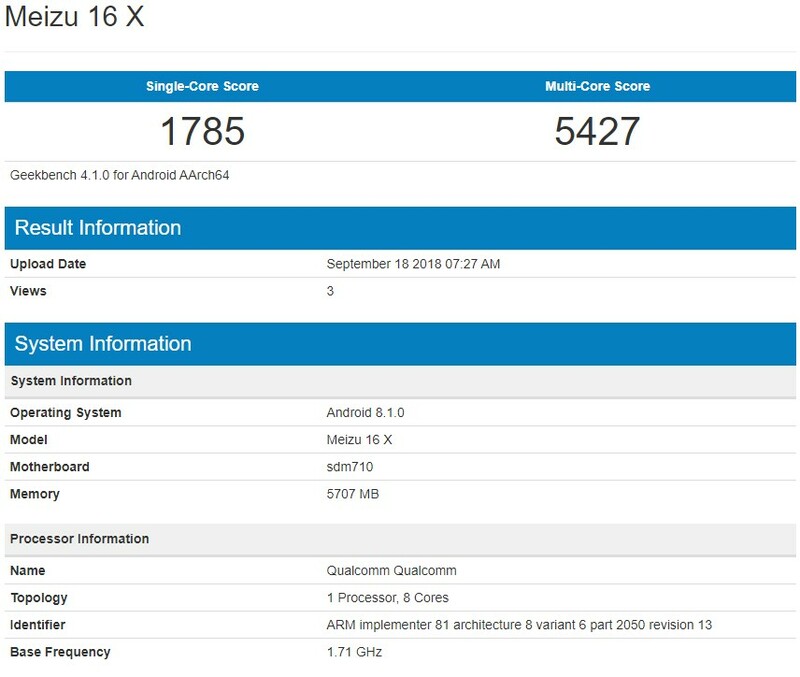 The 6-inch Meizu 16X is apparently ready for its September 19 launch, since it surfaced on Geekbench for no less than three times starting yesterday. However, there is only one hardware setup in these listings. The device tested sports a Snapdragon 710 processor, 6 GB of memory, and runs Android 8.1 Oreo. 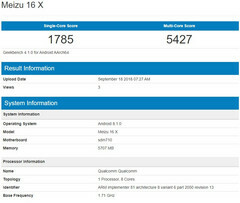 Yesterday, the upcoming Meizu 16X phablet surfaced on Geekbench. Today, the benchmark database gained two more entries showing the same handset. Unfortunately, we are not talking about three different hardware setups here, because all the benchmarks ended up returning similar results and it looks like a single device/configuration has been tested. As usual, there is not too much information to extract from the Geekbench database entries, but the essentials are all just as expected: Qualcomm Snapdragon 710 processor, 6 GB of memory, Android 8.1 Oreo. The operating system should be Android 9.0 Pie for any such device that launches nowadays, but we hope that the Meizu 16X units that will hit the market will come with it onboard. According to Meizu's CEO, Jack Wong, the high-end variant of the Meizu 16X will feature no less than 8 GB of memory and 128 GB of internal storage space. The TENAA listing of this handset revealed a 6-inch AMOLED display without a notch, with 2,160 x 1,080 pixels. At last, we should also mention the in-display fingerprint reader and the launch date: September 19. Now, all that remains is the hope that the Meizu 16X will not become another attractive handset that cannot be found in retail stores outside of China.